Andrews & Dunham have a knack for coming up with some of the most creative names in the tea industry...and turning tea time into an adventure! 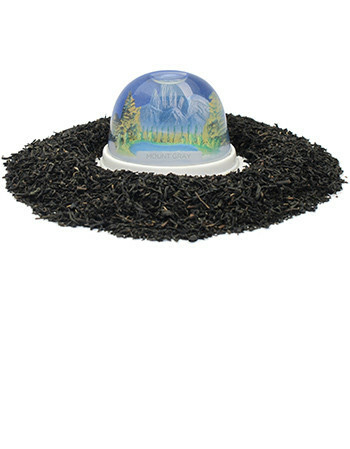 In particular, their Earl Grey blend, dubbed "Visit Mount Gray" is described as containing "Black tea flavored with Bergamot Oil, Mountain Air, Golden Sunsets, and a Lifetime of Adventure." That description causes me to want to undertake an adventure. Time for tea! The bergamot scent of the dry leaves was nearly overwhelming. When I opened the package, the heavy aroma wafted to my nose and shocked me with its strength. Whoah. In the past, I have consumed Earl Grey blends, where there was so much bergamot oil that it was sickening. Thankfully, that was not the case with "Visit Mount Gray." While being heavy, the bergamot aromas were not too thick and unpleasant. A teaspoon of dry leaves joined eight ounces (or a bit more) in a cup for four minutes (or a bit more to balance the extra water). The result was not a cup of tea that reeked of bergamot. Rather, the bergamot scent had settled into the overall blend, for which I was thankful. Eagerly, I awaited the cup being just slightly cooler, so that I might taste the adventure! I took a small sip and the flavor underwhelmed me. Hmmm, perhaps the small amount of extra water was not totally balanced by the small amount of extra time. Back into the mug goes the strainer with the leaves. Another two minutes pass. The smell was still the same smooth blend, but the taste...the taste had blossomed! Blessedly, it was not overwhelming with bergamot, either. In fact, wow, the bergamot was actually complementing the black tea, as it should in Earl Grey! Clearly, my concerns about the amount of bergamot were unfounded. The smooth flavors of bergamot and black tea slid over my taste buds, leaving trace aftertastes of bergamot, pleasantly resting on the palate. 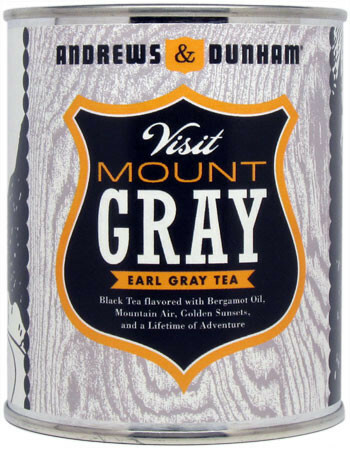 If Andrews & Dunham Damn Fine Tea "Visit Mount Gray" is not the best Earl Grey blend that I have ever tasted, then I am not certain what is better. Well done, Andrews & Dunham. That was an amazing cup. Not too strong, not too perfume-y, but with enough strength and kick to cause you to wake up and take notice, all the while enjoying every smooth sip. On my personal enjoyment scale, I would rate this tea an 89/100. "Visit Mount Gray" can be purchased from the Andrews & Dunham website, here. Photo credit to Andrews & Dunham.